The Boilermakes dominate from the start and earn an 87-61 victory. 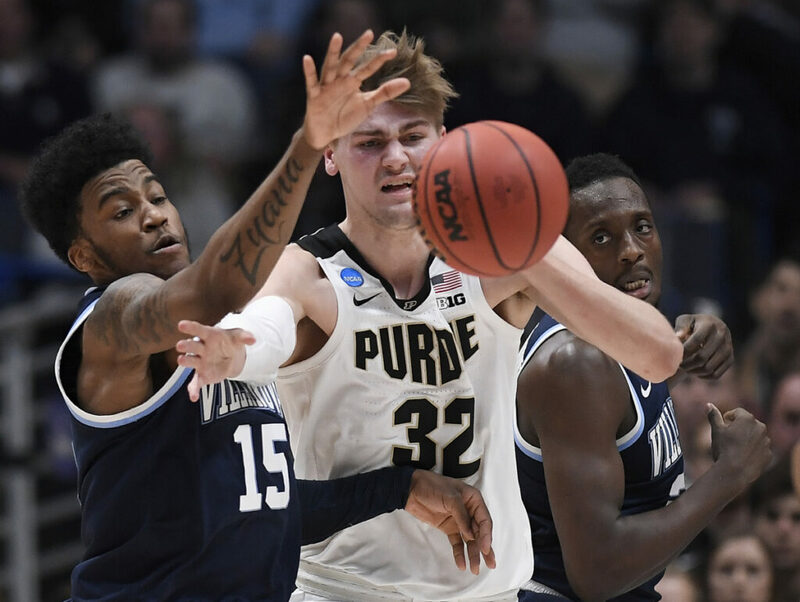 HARTFORD, Conn. — Defending national champion Villanova was bounced from this year’s tournament Saturday night as Purdue beat the Wildcats 87-61 in the South Region. Purdue junior Carsen Edwards finished with 42 points on 12-of-21 shooting while Matt Haarms added 18 points and nine rebounds as the Boilermakers extended their streak of reaching the Sweet 16 to three straight seasons. Villanova shot 35.1 percent from the field and its 87 points allowed was a season high. Senior Eric Paschall had 19 points. LOUISIANA STATE 69, MARYLAND 67: Tremont Waters drove by three defenders and scooped in a banking layup with 1.6 seconds remaining to give third-seeded LSU a victory in the second round at Jacksonville, Florida. Eric Ayala of Maryland (23-11) got off a final shot from midcourt but it didn’t reach the rim. GONZAGA 83, BAYLOR 71: Brandon Clarke had 36 points, eight rebounds and blocked five shots, lifting the top-seeded Zags in the West Region at Salt Lake City. MICHIGAN 64, FLORIDA 49: The second-seeded Wolverines held 10th-seeded Florida to 21 points in the second half, winning at Des Moines, Iowa, to advance to the regional semifinals. FLORIDA STATE 90, MURRAY STATE 62: Mfiondu Kabengele scored 22 points, Terance Mann added 18 and the Seminoles advanced to the Sweet 16 by winning at Hartford, Connecticut. MICHIGAN STATE 70, MINNESOTA 50: The Spartans ran away at Des Moines, Iowa, for a victory in the second round of the East Region to set up a matchup with LSU next week in Washington. FLORIDA STATE: Phil Cofer was on the floor with his teammates for the playing of the national anthem before the game against Murray State. Cofer found out after Thursday’s game that his father – former NFL linebacker Mike Cofer – had died at age 58.